How is that possible? I’m glad you asked! See, in order to keep costs down and win their respective government bids, the contractors who built these bridges and structures did so with zero built-in redundancy. 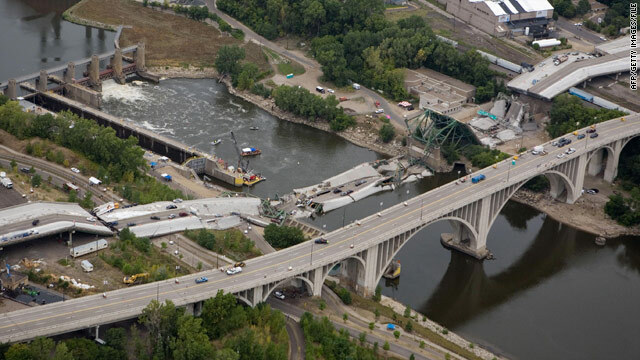 These at-risk spans have been deemed “fracture critical” by private and gov’t engineers, and can will collapse if only a single, vital part of the bridge is damaged. This was exactly the case two weeks ago, when Gawker ran a similar piece on a bridge north of Seattle, Washington, that collapsed when a truck crashed into one of the bridge’s supporting trusses. It’s important to note that the bridge in question, located just outside Seattle, was deemed “structurally fine” by many, and wasn’t part of (what’s been called) “America’s Crumbling Infrastructure” at all. The lesson here, then, is that these bridges can fail if they are hit in a critical spot. Currently, there are about 18,000 “fracture critical” bridges spread throughout the country, according to the report cited by Gawker’s Max Rivlin-Nadler. Max goes on to note that only $3 billion has, so far, been ear-marked for bridge projects under the Obama administration – a far cry from the billions it’s estimated will be required to reinforce existing bridges. Here at Gas 2, we’re very much about innovative technology, saving gas, reducing oil use, and cutting back on harmful emissions … we want all of those things because we love cars, but we also love our families, our children, and (in time) we’ll come to love their children. We’d like to leave them a beautiful country, with clean air and clear rivers – a country that’s better than the one our parent left us, in other words. The car they’ll be driving won’t seem all that important if it’s at the bottom of a river with a thousand tons of steel and concrete on top of it, you know? Let’s fix these damned bridges, in other words. Source | Photos: Too Big to Fall: America’s Failing Infrastructure and the Way Forward, via Gawker, CNN, AP. Does Public Transportation Make You Skinny?